Buyers research your industry before they come to your website. Increasing saturation in content marketing, means that your content can often be lost amongst low quality content noise so how do you ensure you are front of mind before prospects research their industry's offering? B2B advertising used to be a recipe for wastage but now you can target only the companies you desire, making your accounts aware of your proposition and in the mix when the research phase begins. ABM is a marketing growth strategy, drawing on the same techniques that underpin the best enterprise sales strategies. ABM focuses on closing, alongside sales, really high quality business opportunities backed with high levels of insight. These opportunities are the companies you really want to work with, in contrast to so much B2B marketing today, which has focused on delivering high volumes of MQLs (Marketing Qualified Leads) to feed the sales funnel. 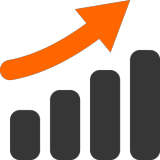 This traditional approach, also called Strategic ABM, works by treating each account as its own market and it can deliver significant growth within new and existing accounts. Until now, ABM has been resource-intensive, treating each account as a market of one, so its value has been limited to just a very small number of accounts. Radiate B2B is focused on scaling ABM strategies so that the majority of companies can take advantage of ABM's benefits. Many of the business leaders we talk to already know something about ABM. Almost all are enthusiastic about it. This should not be a surprise. After all, 84% of companies who use it, say ABM delivers higher ROI than any other type of marketing. Our forecast? Massive return on investment. We’ve seen examples of a 200% increase in conversions from well run ABM strategies. Get Marketing and Sales work together, in alignment, toward the same goals. Let Radiate B2B show you how to bring all this together. How should you start or scale your Account Based Marketing programmes? How should you identify the right accounts over time; align sales and marketing; integrate with other strategies such as Inbound Marketing; create a content strategy. ABM can increase conversion by 200% but it is not a one-off tactic. Once you have finalised your ABM strategy, let us help you to lay out copy; create ads; build landing pages; co-ordinate teams and deliver your account based marketing playbook. We work with major marketing automation platforms (Marketo, Pardot, Eloqua, Hubspot...). Ensure only accounts you target see your advertising. Account Based Advertising will reduce wastage on media spend and increase awareness across your target accounts. We can help you to design and target the right companies before they come to you with our account based advertising platform. A key part of engaging with an account is understanding it. Radiate B2B can help you identify and plan out the best approach to delivering insight, both at the beginning and then week on week as the campaign progresses. Account Based Marketing requires teams like Sales, Marketing and Customer Success to work together. An understanding of the account based approach and how to deliver beyond best practice significantly increases the benefits of account based marketing programs. Account Based Marketing is not a standalone marketing strategy. It scales best alongside an inbound marketing strategy. 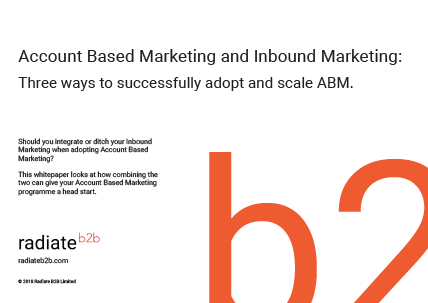 Radiate B2B can help accelerate your Account Based Marketing by integrating it with your Inbound Marketing. 80% of companies found Account Based Marketing approaches outperformed other strategies and 83% saw increased engagement with their accounts. Increased retention and account expansion. Your customers prefer Account Based Marketing approaches as it is much more personalised to them. We help you to implement an approach that will clearly show your customers you care about winning and retaining their account. Increased sales and marketing alignment. Your sales team is already using these techniques but it is often lost inside CRM platforms and done inefficiently. The requirement to work together to deliver target accounts, makes aligning sales and marketing teams easier. How to integrate Account Based Marketing and Inbound Marketing. How to evolve your content marketing to succeed with Account Based Marketing. How to avoid 2 common pitfalls made when incorporating insight into Account Based Marketing programmes.